Hosanna ... a Palm Sunday hand reading! Palm Sunday is known as the Christean feast on the sunday before eastern (in 2009: april 5) - refering to the triumphant entry of Jesus into Jerusalem while he was welcomed with waving palm leaves in the days before his Passion. Including: hands related bible quotes, bible art, and a tribute to the work of pastor Larry Wood: 'Hands in scripture' - which includes a new paradigm for spiritual thinking based on the hand. "He sealeth up the hand of every man; that all men may know his work." "Behold, I have graven thee upon the palms of [my] hands; thy walls [are] continually before me." Elx (Spain) has the location of the biggest palm grove in Europe; on Palm Sunday there is a tradition of tying and covering palm leaves to whiten them away from sunlight and then drying and braiding them in elaborate shapes. "Domingo de Ramos, quien no estrena algo, se le caen las manos"
["On Palm Sunday, the hands drop off of those who fail to wear something new"]. 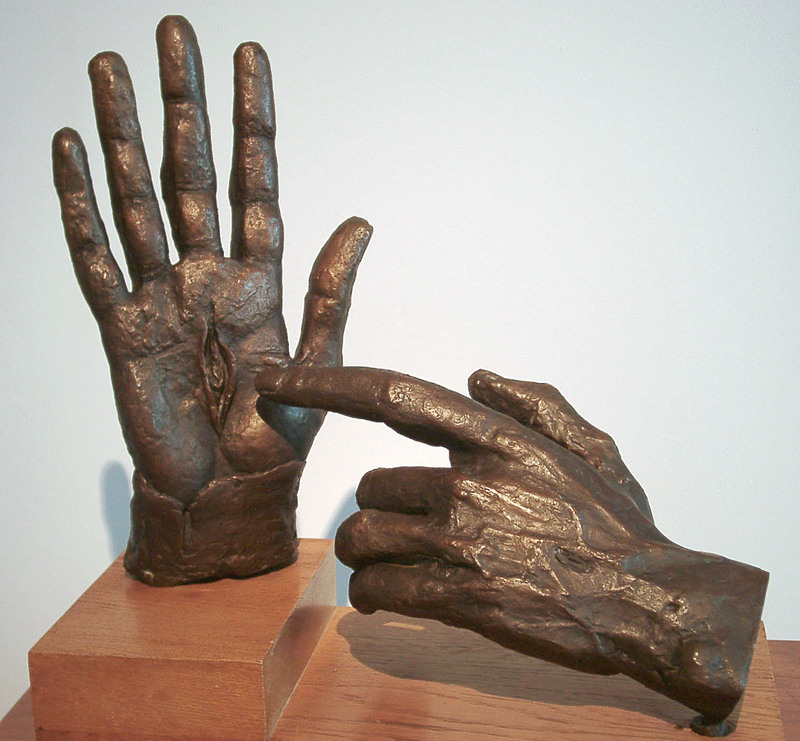 "The human hands as the creation of God are full of symbolic meaning. God made the hands and placed His stamp of approval upon them. He gave each hand a unique identity. No two sets of fingerprints are the same. But do the fingerprints reveal anything other than strange patterns? Each hand has 5 fingers, the number for grace." "There are strange lines in the palm, which are similar in everyone, and yet with subtle variations. There are a multitude of marks in the palm. Some appear to be symbols of crosses, pits, mounds, spots, and circles. Is there intelligence in these markings? What do they mean? 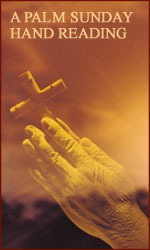 Did God intend for us to understand our own hands?" "The hands are full of meaning that can be readily understood, once a vocabulary and analytical methodology is established." "The understanding of the lines and parts of the hand were clearly understood by Job and Isaiah. 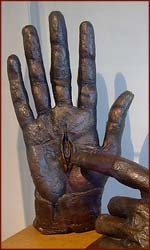 The LORD invented palm reading - not the devil (Isaiah 49:16). Jerusalem was engraved in the hand of Nebuchadnezzar (Ezekiel 21:22). Neither of these verses can be understood without an understanding of hands. " Palm Sunday: be aware of the symbolism!